Browse: Home » 2019 » March » 25 » 17 Years of Biotech Outperforming Pharma Coming to an End? Below I plot a simple chart – the ratio of the PPH pharma ETF vs. the IBB biotech ETF. 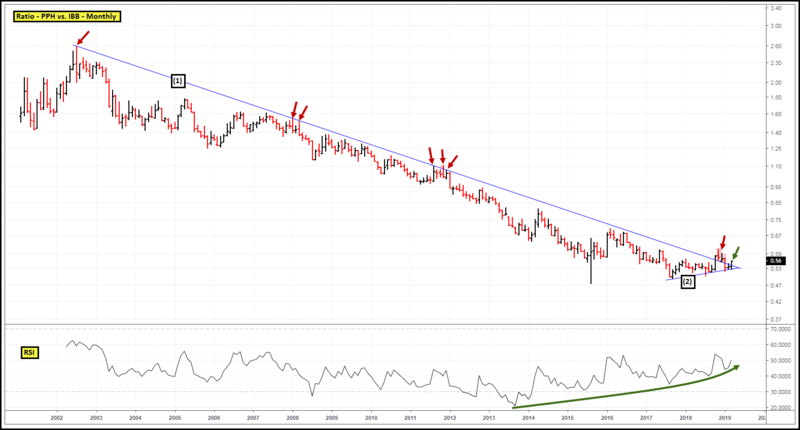 After multiple failed break-outs over the past nearly two decades, you’ll see the ratio breaking above 17-yr downtrend resistance line (1) this month. Resistance line (1), coupled with support line (2), also indicates a technical pattern that is at completion, with no room remaining for price to consolidate. Add in the significantly bullish RSI deviations dating back to 2013 and it seems 17 years of biotech outperforming pharma is coming to or has come to an end.